Number Resource management policies are developed through an open Policy Development Process (PDP). There is no specific requirement to participate in the PDP. Anyone can propose and discuss policy proposals irrespective of geographical location, gender and race. Policy discussions happen mostly on the resource policy discussion (rpd) mailing list, which is open to anyone, including all its archives, and at AFRINIC Public Policy Meetings, which take place twice yearly. Anyone is free to contribute to policy discussions and propose policy. Policies are developed by the community through the PDP that is also developed by the same community. AFRINIC implements what the community has proposed, discussed and attained consensus on. 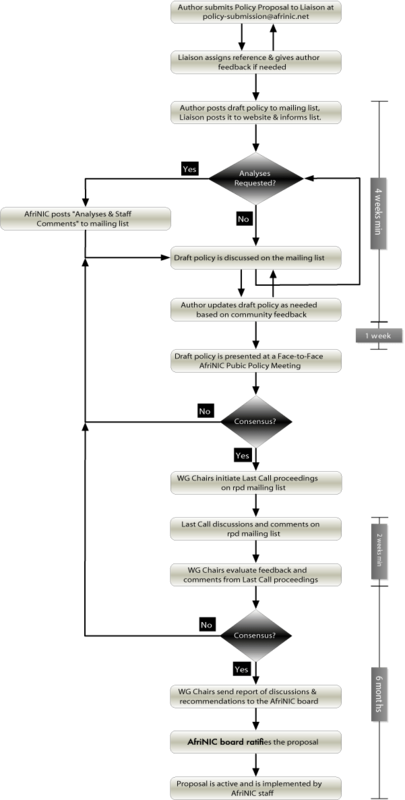 Policy proposals are assigned the following different “status” values in their PDP life cycle until they have been implemented and added to the Consolidated Policy Manual. Proposal is open to discussion on the mailing list. Category refers to resource or service type affected by the proposal. Valid categories are ASN=AS Numbers, v4=IPv4, v6=IPv6, DNS=all DNS matters, GEN=all others. Number= Serial number within that year starting from 001 for that category of policy documents. nn=Integer that starts with 01 and increases by 1 for every new version of the proposal. If/when the proposal is implemented, numbering is abandoned as the content as ratified will get inserted into the Policy Manual. Subscribe to the RPD mailing list and join the discussions. Archives of all previous discussions are available here. Propose new policy or a modification to existing policy. Attend a public policy meeting in person or remotely to discuss your proposal and other proposals. Minutes of all previous policy discussions at public policy meetings are available here. Please use the policy proposal template below to format and present your proposal.